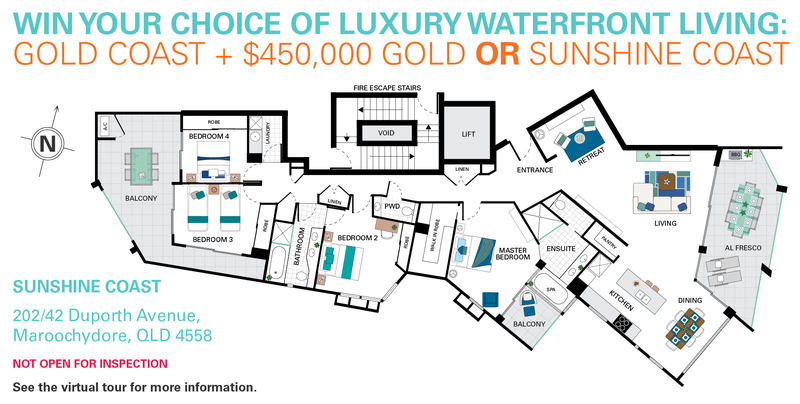 Draw 328 gives you your choice of a luxury waterfront home on the Gold Coast + $450,000 gold or a luxury home on the Sunshine Coast. Close proximity to major retail outlets Harbourtown and Westfield Helensvale, parks and reserves, some of the Gold Coast’s most popular family theme parks and all major Gold Coast destinations, including Surfers Paradise and Broadbeach. $105,020 worth of furniture and electrical appliances. Rates and water paid for 12 months. A spacious house-sized apartment with breathtaking views across the Maroochy River to the ocean. Entertain with the ocean as a backdrop in the spacious open plan kitchen, dining and living areas or on the large, north-east facing balcony. Enjoy ocean breezes when relaxing in the master bedroom with walk-in-robe, ensuite and its own private balcony. 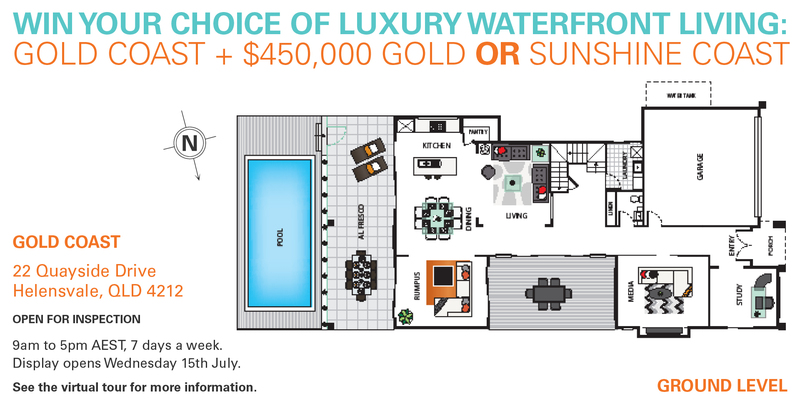 Facilities include heated lap pool, gym and pontoon. A short stroll to renowned beaches, restaurants, bars, boardwalk cafes and boutique shopping and close to popular coastal suburbs of Mooloolaba and Alexandra Heads. A great estimated rental return of $1,000 per week. $85,677 worth of furniture and electrical appliances.